Brachial Plexus Injury Stem cell therapy-The increasing evidences of cerebral palsy in developed countries have raised alarming signals to find a possible cure or to identify the root causes of the abnormality. Cerebral Palsy, more commonly known as the CP is a non progressive motor function abnormality in child; affecting their crucial functions, such as locomotion, self control as well as coordination, speech, etc. While the abnormality is quite intricate, with different types of complexities ranging from mild to severe; and hence cannot be managed by targeting one aspect at a time. Thus, in order to offer the best possible treatment option, it is mandatory to understand anything and everything about the same. One of the quite unknown forms of cerebral palsy is brachial plexus injury, also named as neonatal brachial palsy. The brachial plexus is a group of nerve fibers, transmitting information about important functional organs through the neck and spine. Thus, infant affected with such kind of injury is associated with severe damage to any part of the nerve fibers; the extent of malfunction is dependent upon the location and cause of injury. 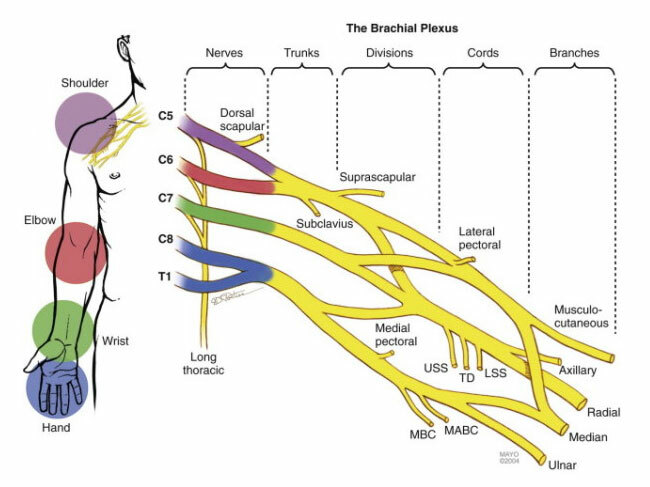 One of the most common and frequently notified causes of brachial plexus include over stretching as well as forceful normal labor at the time of delivery; often assisted with the use of specialized tools, breech delivery, maternal diabetes, obesity, etc. Moreover, prolonged labor can apply stress on the baby’s shoulder, head, upper arms; leading to tearing, bruising as well as damage to the brachial plexus nerves. It is the most common, yet least severe type of injury amongst all, which is generally associated with minor strains, tears or damage in the brachial plexus nerves. Being the mildest amongst all, it is generally been subsided within few months, with local applications. The common symptoms that are been associated with it can be noted as, muscular weakness in the affected area, burning sensation, sensational disturbances, etc. It is often associated with brachial plexus damage in the upper arm; and the extent of its severity depends upon the type and cause of the injury. Some of the dangers associated with the type of injury are full as well as partial paralysis in the affected arm, loss of sensory as well as motor functions, decreased grip as well as numbness in the affected locations, etc. It is the injury associated with lower part of the brachial plexus nerves affecting hands, wrists as well as nerves; often resulting into numbness, loss of feeling, partial as well as full paralysis in case of severe injuries. It occurs when the scar tissues grow besides the injuries, thus applying excessive pressure on the injuries. Although symptoms are quite common; it is as well important to understand that each injury as well as the cause of injury is different and hence should be tackled accordingly. Conventional medical practice does not have any cure for the kind of injury, apart from surgery. However, lots of risks are associated with the surgery with other possible complications such as opportunistic infections, etc. Although, with the application of alternative therapeutic practices, such as stem cells therapy, it would now be possible to alter body’s internal mechanism naturally as well as effectively. Stem cells are the naïve cells of the body with the ability to differentiate into multiple cells types of different organs. This extraordinary property of the said cells has been therapeutically applied for the regeneration of lost or damaged cells. In case of brachial plexus, the lost nerve cells can be replaced as well as repaired with the help of patient’s own stem cells isolated from autologous tissues. Although, research about the effective utilization and application of stem cells is ongoing, currently stem cells therapy could be noted as the better as well as safe alternative for the disease management.